AUSTIN, Texas--(BUSINESS WIRE)--KB Home (NYSE: KBH) today announced the grand opening of Piney Creek Bend, its latest collection of new single-family homes in the Austin area. Located in Bastrop, which features a charming and historic downtown district and numerous area parks, Piney Creek Bend offers convenient access to major thoroughfares and easy commuting to area employers. The KB homes at Piney Creek Bend will be built to current ENERGY STAR® certification guidelines and include WaterSense® labeled faucets and fixtures, meaning they are designed to be more energy and water efficient than most typical new and resale homes available in the area. These energy- and water-saving features are estimated to save home buyers between $948 and $1,440 a year in utility costs, depending on the floor plan. 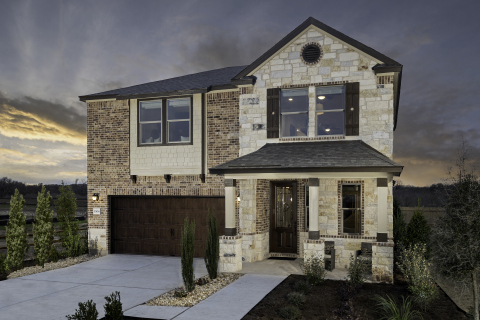 KB Home announces the grand opening of Piney Creek Bend in Austin.